We’ve performed golf course construction of many shapes and sizes, and are experts at golf course design and golf course installation. Our 100% recyclable greens use the finest fake grass for the most realistic artificial greens on the market. Putting green construction of our Nicklaus synthetic greens takes location and climate into consideration. Begin golf green construction and install a putting green today. Learn how easy our golf course installations can be, and how our putting greens can elevate your game. 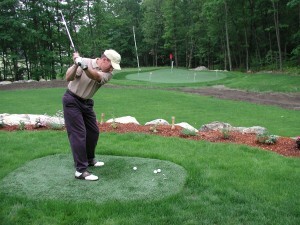 Our golf course designs and golf course installations are completed using the finest fake grass and expert construction techniques. Each golf course construction of our putting greens takes into consideration size and layout issues. And our outdoor and indoor artificial greens are constructed using the best synthetic greens available today. Begin your putting green construction right away. At DP Turf we are experts at golf green construction and putting green construction, and can install a putting green virtually anywhere. Our golf course installations are quick and easy, and each golf course design and golf course construction is constructed with space and layout in mind. 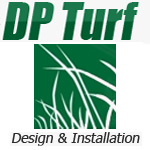 DP Turf are Experienced Professionals who continue to deliver excellent customer service and top of line products. Providing Services for all of MA and NH – from Cape Cod to the White Mountains! Why should I choose SWG for my putting green installation? Do you offer golf course installation of Nicklaus Design greens? Does your golf course construction work in any size yard/space? Do you offer custom golf course design? We offer custom miniature golf course design and golf course construction including quick and easy construction and installation. Our builders use only the finest artificial turf and synthetic grass, and each of our USA made 100% lead free synthetic turf course designs are built to customer specifications. Let DP Turf bring the game home to you. Do your synthetic greens play like natural grass greens? Our synthetic greens made from synthetic turf give you a true roll every time. Begin your golf course construction and putting green installation and see how real our 100% lead free USA made synthetic putting greens can be. We’ll custom design your synthetic grass green as we do with every golf course installation. Golf green construction is easy, so why not install a golf green of your own? Artificial grass — is it right for me? Is your backyard golf green resistant to weather? DP Turf has installed thousands of artificial golf greens in backyards. Leave the planning to the experts. If you want an indoor synthetic golf green or outdoor golf green, DP Turf will help you build that golf green. DP Turf’ artificial home golf green is made of high quality polyethylene material. This material makes our synthetic golf green versatile and helps it move just like natural grass. Our residential golf green is the perfect replacement for your natural grass lawn. Your kids will have hours of enjoyment on our beautiful synthetic turf. Our home golf putting green is the best replacement lawn available. You no longer have to worry about your water bill getting out of control. Our home golf green is low maintenance and long lasting. Get yourself an artificial golf green today. Artificial putting green installations in residences and commercial settings can be a fast process when you choose a professional artificial putting green installation company. DP Turf has years of experience installing and constructing putting greens for homes and businesses worldwide. Choose a reputable company when thinking about installing a putting green indoors, outdoors, or for your business. DP Turf’ synthetic putting greens are what many professional athletes from the PGA proudly endorse. Practice on the golf green that professionals practice on; practice on a synthetic green from DP Turf.